Fordham, Cambridgeshire. View from the signal box looking towards Chippenham Junction. The bracket signal right hand post carried the branch signal for the Mildenhall line, the trackbed of which can be seen diverging to the right across the fields towards Burwell, the distant being for an intermediate block home signal located between here and Chippenham Junc. 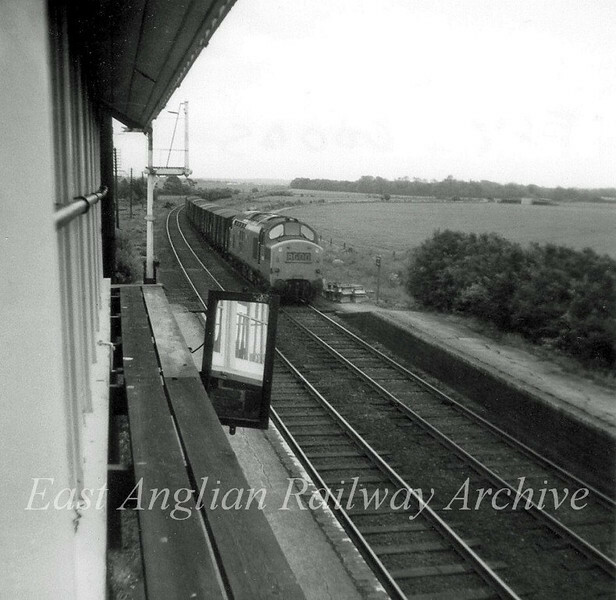 The mirror presumably was for sighting in the Ely direction, especially the status of the crossing gates, which may have been obscured by the station canopy. Photo with kind permission of Gavin Sandeman.